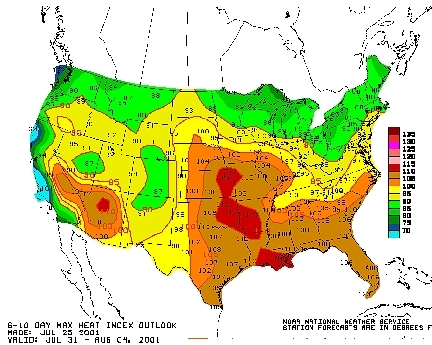 Map by the National Oceanic and Atmospheric Administration (NOAA) where red indicates highest temperatures projected for July 31 to August 4, 2001 after previous week of abnormally high temperatures. July 25, 2001 Washington, D. C. ­ Late July 2001 temperatures in Texas, Oklahoma, Kansas, Arkansas and New Mexico have averaged five to ten degrees above normal. According to the National Oceanic and Atmospheric Administration (NOAA)'s National Weather Service, central Kansas hit 109 degrees Fahrenheit and southwest Oklahoma sweltered at 108 degrees F.
Previous PostPrevious Missing Link Between Humans and Chimpanzees ­Ethiopian Forest Bipeds 5.8 Million Years Ago?